Heat oven to 450°F. Grease rectangular baking dish,13x9x2 inches. Cook sausage and ground beef in 10-inch skillet over medium heat, stirring occasionally, until brown. Drain; set aside. Stir Bisquick and water in large bowl until dough forms. Divide dough into 2 parts, 1 part slightly larger. Roll larger part dough into rectangle, 16x14 inches, on surface dusted with Bisquick. Fold crosswise into thirds. Place in center of baking dish; unfold. Press on bottom and up sides of dish. 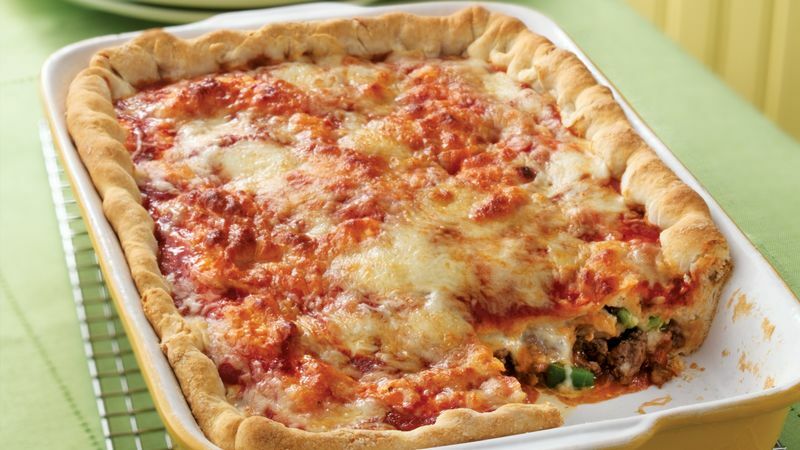 Sprinkle with 1 cup of the cheese; top with 3/4 cup of the pizza sauce, the meat mixture, mushrooms and bell pepper, pizza toppings and 1 1/2 cups of the cheese. Roll remaining part dough into rectangle, 13x9 inches. Fold crosswise into thirds. Place on cheese in center of baking dish; unfold. Press bottom and top crust edges together to seal. Make small slits in top crust. Spread remaining pizza sauce over crust; sprinkle with remaining cheese. Bake uncovered 22 to 25 minutes or until edges of crust are golden brown. Making small slits in the top crust of your stuffed pizza allows steam to release steadily during baking. This helps prevent larger holes from forming and allows for more even baking. Brown 1 pound each of Italian sausage and ground beef, and use half for the recipe today and freeze the rest for another day.